The latest buzz in tinsel town is that ‘Krrish 3’ will watch Hrithik Roshan donning three roles, that of the son, father and the grandfather! It was earlier said that Rakesh Roshan will be playing the bad guy of the movie, but then Rakesh was keen on Vivek Oberoi doing the role of the antagonist. Speaking to the press, Rakesh expressed that he always had Vivek in his mind for the role as he feels Vivek has the perfect physique that the character requires. Although the project was supposed to have started soon, due to various reasons such as Hrithik’s shooting for ‘Agneepath’ and his promotions for ‘Zindagi Na Milegi Dobara,’ the project got delayed. However, it will go on floors by November this year and Rakesh Roshan is in the location hunting process currently. 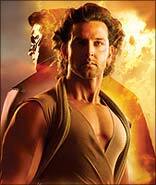 Both its sequels have been blockbusters and with Hrithik now playing three roles in ‘Krrish 3,’ we can only expect a bigger hit!